Black and white negative of members of the Whitby Fire Department standing with three fire engines in front of Town Hall. The trucks in this photograph are a 1946 GMC Pumper (left), a 1926 Gotfredson Pumper (centre), and a 1926 Chevrolet Chemical truck (right). 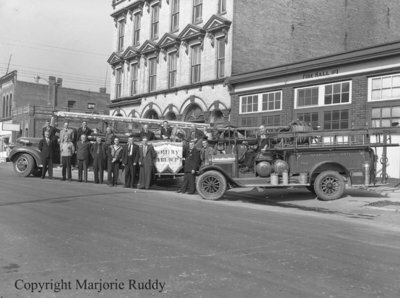 Whitby Fire Department Members with Fire Engines, October 4, 1947, Marjorie Ruddy. Whitby Archives A2013_040_1031.